Getting a group of people together over a cup of tea is a great way to start conversations (and surely one of our national pastimes?). Whether jasmine, Earl Grey or English Breakfast is your bag, why not have a go at raising money at your next tea morning to support our work towards acceptance without exception. Location: You can hold an Equali-tea anywhere you choose. Whether that’s at home, school, work or at your local community centre. Date and time: Whenever suits you. Perhaps you’d like to hold an Equali-tea to celebrate Stonewall’s 30th birthday on 24 May 2019 or as part of your Pride celebrations this summer. It’s up to you! What do I need: Just the willingness to get stuck-in and raise awareness, along with our fabulous free fundraising pack – pre-order your pack with the form above. Setting up your event: Advertise your event with the posters provided, decorate your space with Equali-tea bunting and get baking! Ask friends, family and colleagues to donate £1-2 for a slice of cake and a cuppa and encourage everyone to stick around for a chat. Use the Conversation Starters in your pack to help you discuss LGBT equality with your group. We’d love to hear about your experiences of holding an Equali-tea. Photos are a great way for us to spread the word to the rest of our supporters too. Get in touch with our Community Fundraising team at community@stonewall.org.uk or call 020 7593 3477. 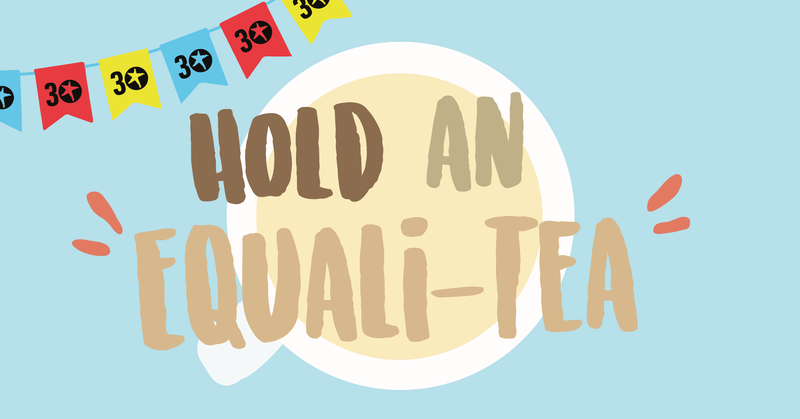 Head to our Donate page to pay-in any money raised at your Equali-tea and select ‘Held an Equali-tea for Stonewall’s 30th birthday’ from the dropdown menu. Alternatively, you can send a cheque to Stonewall, 192 St John St, London, EC1V 4JY. Please make all cheques payable to Stonewall Equality Ltd.